THe internet is everywhere around us, on a multitude of devices. With a bunch of sensors connecting them to the world. We move from multiple screens to more and more things that are on. in around us that are all connected. So what is the world we want to design and how do we interact with them. Look at the mobile – the screens are immersive, they take all our focus. We are looking at designing experiences that gets people’s heads up again. So this is tech to allow us to connect remotely but does not get in the way of us engaging with the environment. The other is a return to the significance of place. We used to only call a place by phone. Then you moved to call a person. Every single person would have a phone. This is a critical change. But now the devices know where they are. And all of the things we will hav eon us, in us will be located in a place. So can we use location as a lens for the interactions. SO you need a model of place. And that is what we are building. We started 30 years ago, the path to build a real-time digital extraction of the world – Nokia HERE. It is a map that is calculated to you personally. It is a lot of work. Industrial, with cars mapping, with partner data from UPS etc. Need more and more data sources to build the model. And then we need the user data. How people are using it, what are they adding. We use that to enhance and improve the quality of the industrial data. Community is needed to get data for maps outside of populated areas. For HERE to grow and improve, it needs to go horizontal, across multiple platforms and that is now happening. And we provide ways for people to build on it too. The main experience is on the phone, but we it is growing. Thinking as location as the lens, it changes what is built etc. The goal is to make experiences that are connected to the world around us. That are personalised. Make them more heads up, more relevant to the environment. But that’s not all. So a deeper dive into what we make. We are a product of Northern EU, even though team is international. And that reflects in how we think. And one way is to refine what people do every day, making them better. It shows in a commitment to purity. To making a product PURE. You take away everything that is not necessary. The other goal is to make products that are BUILT BETTER. Solid, well engineered. Deep collaboration between engineering and design. Then our products are HUMAN, never cold. It’s about how they feel in the hand. They are then always ADVANCED. The right technology. 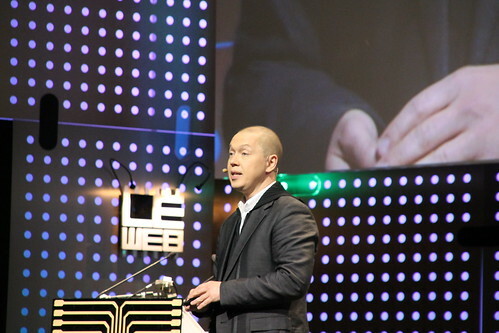 This entry was posted in conference, leweb, mobile by Rachel. Bookmark the permalink.